Corporate Clean Property Services specialise in small to medium suburban retail shopping centres. Shopping Centres have a high volume of pass through traffic and therefore require cleaning on a daily basis, both during opening hours and after hours. When the centre is open to the public, attention needs to be paid to providing a clean and safe environment. Waste bins can fill quickly, thousands of people can use the toilets in a short space of time, and spills can occur frequently making the environment a potential hazard. Corporate Clean property Services can also supply and restock all wash room facilities (with paper products, soap, air-sanitisers, and sanitary bins), clean your bins and enclosures, and clean your outdoor areas and car parks. 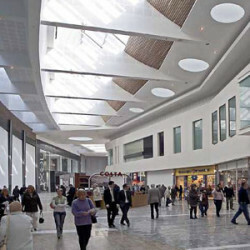 Once the shopping centre closes the real cleaning process takes place with specialist equipment such as auto scrubbers, duplex machines, polishers, and steam cleaning equipment required to maintain the centre to a high standard. Often, managing the cleaning of a shopping centre will require a cleaner to be on site for a large percentage of the time, and these cleaners are briefed on managing the risk of falls and hazards, and maintaining a clean presentation of the centre. Spills must be immediately cleaned and signage must be displayed; dry mopping must occur so as to not leave a further slip hazard. Minimizing risk of injury or illness to patrons and staff in these situations is paramount to the good reputation of the shopping centre and its tenants alike. It is also important that bins be emptied when full to avoid overflow and sanitary bins must also be monitored. Travelators, lifts, tiled malls and washroom areas will also require monitoring and attention to detail. Graffiti can also be a problem and often the emphasis needs to be on removing the graffiti as quickly as possible. Holiday periods can present a more intense array of needs and the frequency of services needs to be adjusted to suit these times. Regular inspections are critical to highlight issues quickly and rectify them immediately. Some contracts require the cleaning company to manage the open and closing of the centre, which requires cleaning staff who both are diligent and reliable in these matters.